You can test a new Configuration Manager client version in a pre-production collection before upgrading the rest of the site with it. When you do this, only devices that are part of the test collection are upgraded. Once you've had a chance to test the client you can promote the client, which makes the new version of the client software available to the rest of the site. To promote a test client to production, you must be logged in as a user with security role of full administrator and a security scope of All. For more information, see Fundamentals of role-based administration. You must also be logged into a server connected to the central administration site or a top-level standalone primary site. There are 3 basic steps to testing clients in pre-production. Configure automatic client upgrades to use a pre-production collection. Install a Configuration Manager update that includes a new version of the client. Promote the new client to production. Pre-production client deployment is not supported for workgroup computers. They can't use the authentication required for the distribution point to access the pre-production client package. They will receive the latest client when it is promoted to be the production client. Set up a collection that contains the computers you want to deploy the pre-production client to. In the Configuration Manager console open Administration > Site Configuration > Sites, and choose Hierarchy Settings. To change these settings, your account must be a member of the Full Administrator security role, and the All security scope. During installation of the update, on the Client Options page of the wizard, select Test in pre-production collection. Complete the rest of the wizard and install the update pack. After the wizard complete, clients in the pre-production collection will begin to deploy the updated client. You can monitor the deployment of upgraded clients by going to Monitoring > Client Status > Pre-production Client Deployment. For more information, see How to monitor client deployment status in System Center Configuration Manager. The deployment status on computers hosting site system roles in a pre-production collection may be reported as Not compliant even when the client was successfully deployed. When you promote the client to production, the deployment status is reported correctly. The Promote Pre-production Client button is also available when you're monitoring client deployments in the console at Monitoring > Client Status > Pre-production Client Deployment. Review the client versions in production and pre-production, make sure the correct the pre-production collection is specified, and then click Promote, then Yes. After the dialog box closes, the updated client version will replace the client version in use in your hierarchy. You can then upgrade the clients for your whole site. 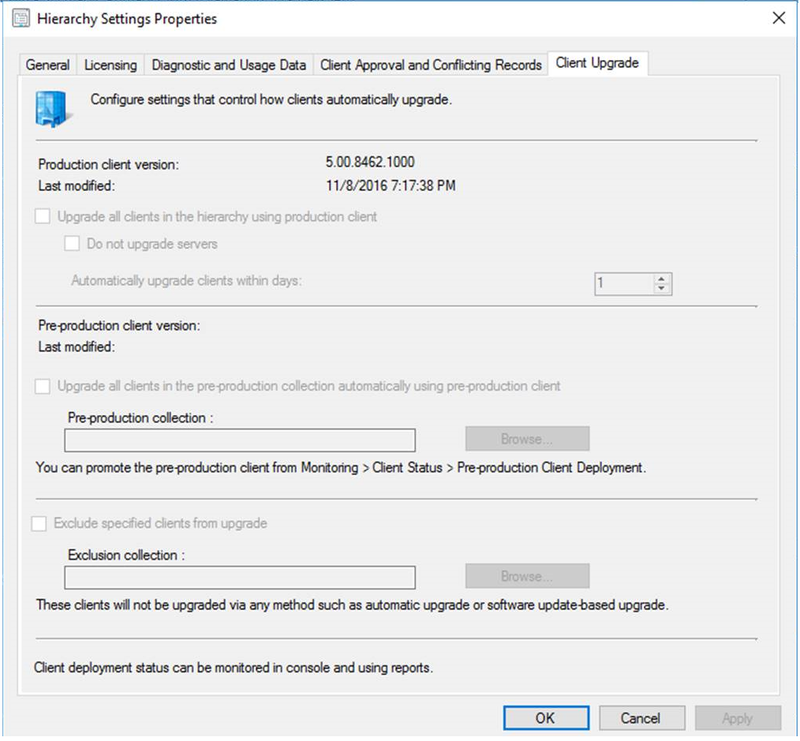 See How to upgrade clients for Windows computers in System Center Configuration Manager for more information. To enable the pre-production client, or to promote a pre-production client to a production client, your account must be a member of a security role that has Read and Modify permissions for the Update Packages object. Client upgrades honor any Configuration Manager maintenance windows you have configured.